Human Atheroma (with Particular Reference to Endocrine Aspects of Aetiology) examines the endocrinological features of human atherosclerosis. This book is composed of 11 chapters that discuss the pathological sequelae and descriptive epidemiology of atheroma, commonly known as atherosclerosis. This book also addresses the mechanisms of arterial occlusion in the disease and the epidemiological observations on atherosclerosis. 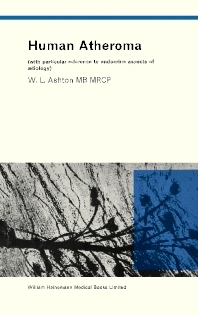 Some of the topics covered in the book are the clinical and pathological observations on atherosclerosis; common considerations in the association of endocrine with the disease; ovarian function and atheromatous disease; relationship between thyroid function and atherosclerosis; and clinical and epidemiological connections of atheroma and insulin. Other chapters deal with the associations between the development of diabetes mellitus and insulin, as well as the assay methods for insulin and insulin antagonists. An analysis of the hormonal disturbances in diabetic patients and their relatives is provided. The remaining chapters consider the insulin antagonism in diabetes mellitus and the measures suggested to decrease the number of atherosclerotic patients. The book can provide useful information to the cardiologists, doctors, students, and researchers.